All writers approach character development differently. Some start with nothing other than the very basics and let the character grow naturally with the story. Others create simple “fact” sheets for vital stats. Other still create in depth notes about their character’s deepest needs and wants, every important childhood memory, and the date on which they lost their first tooth. I’m not here to persuade you that any of these approaches (or any other) are the right one for you. In fact, if there is but one universal writing truth out there it is this: everyone should do what works for them, period. So instead, I’m just going to cover some of the pros and cons of doing bio sheets, for anyone who might be trying to make the decision whether to bio or not. I’ve actually tried all three methods (none, light bio, and heavy bio), and find that each of them work for me in different ways, and each have their upsides and downsides. You keep your facts straight, and in one simple, organized place. This makes continuity editing easier down the road. Through writing biographies, you often learn more about your character. Sometimes asking yourself questions about what they fear most, or what gets them out of bed everyday can be the difference between a one-dimensional character and a fully fleshed one. When you know your characters inside and out, it makes their actions and reactions more consistent. If you need to shelve your project for a while, having a biography can make jumping back into it quicker and smoother. A lengthy character biography can be incredibly time consuming, especially if you’re doing this for multiple characters. Sometimes over-defining your characters can be counter-intuitive to the creative process and you can end up writing yourself into a corner. Many writers feel like the characters have a mind of their own, and can often take the story in unexpected directions. Biographies can limit this experience. When writing a character sheet full of facts, it can be tempting to find a way to include all of them throughout the story, which can lead to data overload if not careful. One tip I will leave you with: Whether I do full biographies for my characters or not, I will ALWAYS keep a “fact sheet” of things as I write. If I say someone’s eyes are blue, well, they better be blue if they ever get mentioned again. If I say someone’s favorite restaurant is Brennan’s, it needs to be Brennan’s if it comes up later. If character 1 is taller than character 2 in one scene, they can’t see “eye to eye” in another. Consistency is a key part of editing, and keeping track of facts as you go will make that process simpler. 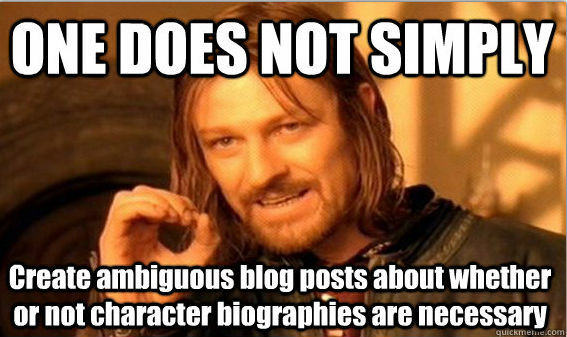 What thoughts do others have on the pros and cons of character biographies? hehe agree with you on having the facts! 😛 love the meme! I for one have a bio for main characters only. A bio for one main character is a good idea…for the others do you do some basic scratch/fact sheets or nothing at all? I like how you listed out the pros and cons. The fact sheet idea is good. Thanks for the comments, and for stopping by April! Find a way to use the chef ramsay meme where he screams at people for undercooking stuff. That’d be greeeeeat. I totally agree with making a basic fact sheet. I forget small details all the time. Eye colours and heights change from chapter to chapter if I’m not careful. YES! I will have to remember that one for the next time. I actually once had a character with a dog, and the dog’s name changed like four times in the story. That’s when I knew it was time to start tracking things. Oh man, yeah, that’s pretty bad. I should probably make lists more often. Ah well, I’m lazy – I’m sure everything will work out fine. Well laziness is next to godliness, right? Wait, I think that’s cleanliness. Crap. Picking up quite a few points on and from Your Writing Tips. Thanks for sharing.